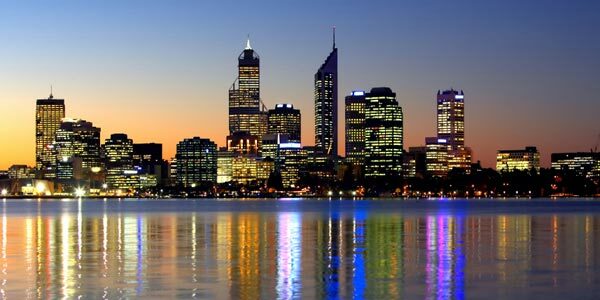 Perth, one of the most isolated metropolitan areas in the world, after World War II became home to about 1,500-2,000 Latvian immigrants or, more precisely, political refugees. The Latvian population now is estimated between 400 and 500. In the 1950s, Latvians were scattered throughout Western Australia, Australia’s largest state. Approximately 2.2 million people, about 10 percent of Australia’s total population, currently inhabit the total area of 2,527,630 square kilometers. Many Latvian immigrants in Western Australia were employed as railway maintenance workers, particularly on the Trans-Australian Railway. In the early 1950ss, this railway was the most important link between Australia’s east and west coasts. Many Latvians were also employed on the local Laverton-Leonora-Meekatharra line and other railway connections within the state. Whilst everybody enjoyed peace and freedom in their newly adopted country, living conditions were primitive, particularly in the railway maintenance sections. The conditions often more primitive than those in the displaced persons camps in Germany. Maintenance workers and their families lived in tents without floors. Fresh food was supplied once a week and there was no refrigeration available. Sandstorms and hot weather were common. These working conditions were not exclusive to the immigrants. Australians who chose to work there had to endure exactly the same conditions, however, they were few and far between. It was compulsory for immigrants to work for two years in designated areas of labour shortages, irrespective of their qualifications and abilities. This two-year contract work was more or less a repayment for the free passage from Europe to Australia. Many of the railway workers were qualified professionals. One wonders why Australian authorities wasted the knowledge of doctors, engineers, scientists and others of which there was a shortage in Australia. Excuses such as standards of their qualifications could have been tested almost instantaneously. Those designated and engaged in forestry work enjoyed not only better accommodation, but also had fewer problems with heat, insects and sandstorms. Very few migrants remained in the countryside after their contracts expired. Most moved to Perth or larger country centres, such as Albany, Bunbury and Mandurah. Many moved to the capital cities of the East—Adelaide, Melbourne and Sydney. 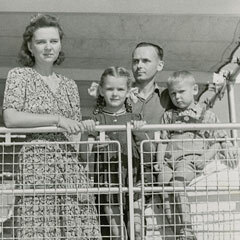 As in all larger centres in eastern Australia, the Latvian community in Perth had its organizational beginnings in the early 1950s. Perhaps the most significant initial work undertaken was that of Pastor Leo Kampe, a Lutheran minister who was invited by the Lutheran Church of Australia to provide spiritual care and Lutheran church services to Latvian (and also German) Lutherans. Kampe traveled throughout Western Australia and conducted services to scattered groups of Latvians. His little daughter Ieva accompanied him on many of his travels. Coincidentally, Ieva Vlahov is now the chairperson of the Latvian St. Paul’s Lutheran Congregation, the congregation that her father established. Kampe was not only the driving force behind the construction of the original Latvian church hall, he was also the chief brickmaker and bricklayer. Not having laid any bricks before in his life, he just said that need is the best teacher. Kampe also organized the Latvian Sunday school and started a publication, Draudzes ziņas. He was an ardent opponent of communism, not only because of its atheism and political philosophy but also because his parents were killed by communists during the First World War, and two of his brothers disappeared without trace during the second occupation. To the great regret of many Perth Latvians, he resigned his ministry in 1969. A number of other organizations and groups followed. These included the Latvian Association of Western Australia, the Latvian Relief Society “Daugavas Vanagi” Perth Chapter, the Latvian Dramatic Society, the Latvian Mixed Choir, the Latvian Folk Dancing Group “Perkonītis,” the Latvian Relief Society Male Choir, the Latvian Catholic Association, the Perth Latvian School and other local interest groups. The relatively small church hall could accommodate only about 100 people. For larger gatherings, other halls had to be hired. The three largest organizations –- St. Paul’s Lutheran Congregation, the Latvian Association in Western Australia and the Latvian Relief Society “Daugavas Vanagi”—pooled their resources and, with the active participation and significant financial donations of 521 members of the Western Australian Latvian community, bought a parcel of land in Belmont, a suburb about 4 kilometers from Perth’s central business district. Design and construction of the Latvian Centre was undertaken exclusively by members of the Latvian community. The hall was constructed under the direction of Jonis Plucis, managing director of J. & I. Plucis Pty. Ltd. The hall could accommodate 250 people. The complex was later expanded with the addition of the Latvian Library and the Latvian Relief Society Club. Ēriks Ozoliņš, managing director of Westland Development Pty. Ltd., donated the materials and constructed an altar room that was consecrated as a Lutheran church and is opened only during services. One of the greatest achievements of this relatively small community was the organization of four Australia-wide Latvian Arts Festivals (Kultūras dienas). With the exception of the mixed choir and the folk dancing group, the organizations mentioned are still active. Regular Latvian broadcasts continue every Saturday on radio station 6EBA-FM under the guidance of Jānis Vucēns and Rita Johnson. Every organization needs a driving force. Not all names can be listed here; however, the principal contributors cannot be omitted. Pastor Laimons Mušinskis, who replaced Kampe, also took the chair of two arts festivals. The other two chairpersons were Voldemārs Balodis and Juris Pārups. After Latvia regained independence Mušinskis was appointed a member of the Faculty of Theology at the University of Latvia and conducted several courses there. He also wrote four theological textbooks in Latvian. For his work as Western Australia district president of the Lutheran Church of Australia and for his activities in the Latvian community, he was awarded the Queen’s Medal and Latvia’s Order of Three Stars. For many years, he was also the editor of Pertas latviešu ziņas. Jānis Grīnvalds served for many years as the chairperson of the Latvian Association in Western Australia, as did Ludmilla Gutmarcis, who was also the long-standing chairperson of the Ladies Guild of the St. Paul’s Lutheran Congregation. The Latvian Association now is led by Voldemārs Auziņš. The Latvian Relief Society “Daugavas Vanagi” was led for many years by Jonis Plucis and Vilis Gutmarcis. Its current chairman is Ilmārs Rudaks. Zigurds Titmanis served for several years as the chairman of the St. Paul’s Lutheran Congregation and was also the inaugural chairman of the Latvian Centre Pty. Ltd., a company managing the Latvian Centre. Active participants of the Latvian Dramatic Society included Pārups, Julijs Bernšteins, Dailonis Olmanis and Augusts Kudeika. Zenta Dunsis led the Latvian Folk Dancing Group for many years. Together with the Mixed Choir, they participated in many ethnic festivals throughout Australia. Kārlis Rīdūzis, an active member and elder of the St. Paul’s Lutheran Congregation, edited two publications about Latvians in Western Australia entitled 35 years of St. Paul’s Latvian Evangelical Lutheran Congregation and Perth Latvian Centre 1972-1994. Notwithstanding the small size of this community (the St. Paul’s Lutheran Congregation, ministered by Pastor Gunis Balodis, has 112 registered members), it is still active. An important cohesive force of the community is Jānis Lūks, the vice chairman of the Latvian Association of Australia and New Zealand. His activities in the Latvian Centre as well as in the congregation, and his maintenance of contacts with the wider Australian community, will ensure its continuity for many years to come. 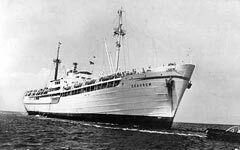 The M/S Skaugum, a transport ship, was among vessels that carried Displaced Persons from Europe to the port of Fremantle in Western Australia. My Opa, Eriks Kviesis, was I belive the founder of the Latvian Association of Western Australia. He and my grandmother, my mother and her sister came to Perth and lived in one of the workers camps, despite both being qualified solicitors (their qualifications were never recognised). Opa’s father was former Latvian President Alberts Kviesis. I’m sure if he was still alive today, he’d be thrilled to know that the Association continues on. I travelled to Latvia for a reunion of Opa’s family in August 2006 which was an incredible journey of discovery. My Opa was a private man, and did not share a great deal of the harder side of his life with his grandchildren. If anybody has any photographs of my great grandfather Alberts I would love to see them, as very few made the journey from Riga to Perth many years ago. They can be e-mailed to mood_indigo66@yahoo.com.au. Thank you. Labdien!! GREAT to read an article on Latvians in Perth!! My father and his father are Latvian, my sister and myself attended Latvian School in Belmont in the mid 70’s. My Ahpa Peter Jeps, now passed away sadly some years ago had a strong, connection with the Latvian Centre in Belmont at that time. I would like to continue the link of the relatively small cultural group and the traditions and heritage for myself really and my children. I believe the Centre is open on weekends? And am hoping to visit the library in the not too distant future. Anyone who attended the centre at that time and remembers my AhPa can contact me at the email address provided. Thankyou! Hello all Latvian bread lovers! Great news!!! From 25.03.2010 you can buy bread bakery “Lāči” bread in City – Perth! Shop and adress: Euro Delish, 540 Stock Road, Central Markets, Bibra Lake,WA 6163. The photo of Perth above. The tall pointed building on the right hand side. A latvian (me) was heavily involved in the the design and documentation of that building, up to 1982. The current main tenant is going to move to Raine Square; and I’m also working on that project, which happened to be designed by a half-latvian. By chance,did your relative have a brother/cousin named Voldemars? I ask because Voldemars Titans was my confrere in Frat! Academica. Does anyone know where has EuroDelish shop moved? It is not located in Stock Road markets anymore, and I cant find their new address. Euro Deli’sh is now located at Leeming Park Shoping centre, 1 Dundee street,Leemin, WA 6149 cr Beasley road. Can anybody give me contact details for finding out about Latvian cultural events happening in Perth please? Hi my grandfather was Imants Amers and I have been trying to find information for years as even my dad knew very little of him. Hi Sande, were you able to find any information? I’m asking out of curiosity as my family are Amers’, and we are related to the Ratnieks. The McKinlay’s actually employed my great grandmother in Newdegate. Thank you in advance! I’d love to discuss things further with you. Just reading your post, a bit late, how remarkable a co incidence, my father and mother also from Tukums, (Ernests and Austra POLIS), they also came out on the Mozzafarri in 1949, even more remarkabe was that they were in Lake Biddy where dad worked on the railway line as a fetler until they moved to Cottesloe where I was born in 1951. I wonder if you were ever able to find out more about your family from Tukums, Latvia? I too have a connection with this region through my mother’s parents i.e ADOLFS & JOHANNA MAZURS. My father was Latvian Janis Stumps arrived at Fremantle 1949 on the “Goya” and then spent sometime at the Northam immigration camp. Just wondering if anyone remembers him and maybe have photos to share. I have for sale a number of framed (about 15x24cm) water-colour paintings of Latvian national costume by Verners Linde, a displaced person, carried out whilst he was an occupant of a camp at Blomberg, West Germany in 1945. He later migrated to Australia and was engaged for a time on a series of murals in Canberra.